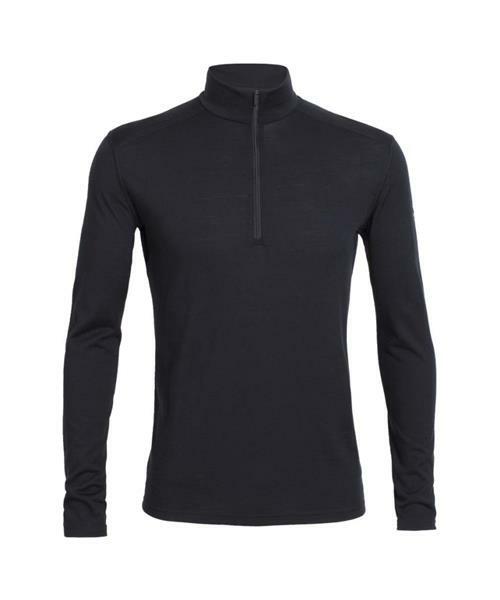 The Men's Oasis Long Sleeve Half Zip is the ultimate do-everything baselayer. Built from Icebreaker's soft, luxurious 200gm merino jersey fabric, Oasis keeps you warm in cool weather and breathes well as you heat up. And you can open the half zip for instant cooling on the fly. To ensure comfort on the move, the Oasis Long Sleeve Half Zip has offset shoulder seams, set-in sleeves and flatlock stitching throughout, plus a slightly longer bottom hem in back. It's a good thing merino resists odor so well, because you'll want to wear this shirt for every activity, day after day. Oasis LS Half Zip - Mens is rated 4.7 out of 5 by 37. Rated 4 out of 5 by Lelly from Great for xc skiing I like this piece for xc skiing adventures and winter running as it is light and warm. If I would change anything, I would want it to be an inch+ longer in the body as I am 5'10". Otherwise, it is perfect. Rated 4 out of 5 by Curler from Not Quite Looking for a base layer with a zip collar that can become a turtle neck for curling. I'm usually a small fit but the small that I ordered fit more like extra small. Afraid to try the medium in case it's too big. I have an ice breaker 260 weight in a small that I bought at the local ski store and it fits. Had to send it back. Rated 4 out of 5 by AEIvintage52 from Only one thing I'd change... Why is Icebreaker stenciling its logo on the sleeve? I am reminded of cheap sports garments. So NOT cool! You do an injustice to your brand. Rated 5 out of 5 by Joefromtoronto from Great product, sizes run small Lovely fabric, well made. These run small all over - arm length, chest, even body length. Definitely go up at least one size. Rated 5 out of 5 by Islanderabroad1979 from Another love story Loving my new Oasis. Being a baselayer it’s form fitting so I sized up to a large. I’m glad I did as these shirts run small. I’m usually a medium in Icebreaker. In the oasis I sized up to a large and find it fits like a medium. As always this is a well made comfortable item that I am grateful to own. Rated 4 out of 5 by OldGirlGuide from Great in all ways except for the logo. I have some Ice Breaker garments that I wear every where. I love Ice Breaker. The Oasis with its logo is the only one I feel differently about, the logo is a detriment. Why not make it as non obtrusive as the other Ice Breaker lines? A great day of skiing followed by a great dinner out all done in an elegant sweater, except the Oasis logo does not look as nice as the sweater deserves!!! Rated 5 out of 5 by Katey from great for underwear and overwear Love the shirt but as other reviews suggest it does fit a little on the small size. I usually wear a medium and I am glad I ordered the large.